NEW YORK (Reuters) - Oil prices roared back from six-year lows on Friday, rocketing more than 8 percent as a record weekly decline in U.S. oil drilling fueled a frenzy of short-covering. In a rally that may spur speculation that a seven-month price collapse has ended, global benchmark Brent crude shot up to more than $53 per barrel, its highest in more than three weeks in its biggest one-day gain since 2009. The late-session surge was primed by Baker Hughes data showing the number of rigs drilling for oil in the United States fell by 94 - or 7 percent - this week. Earlier gains were fueled by reports of Islamic State militants striking at Kurdish forces southwest of the oil-rich city of Kirkuk. Brent settled up $3.86 at $52.99 a barrel, after running to as high as $53.08. U.S. oil futures finished up $3.71 at $48.24, soaring by nearly $3 in a final frenzied hour and ending a two-week stretch of relatively steady prices, the longest break since a seven-month rout kicked off last summer. On Thursday prices had touched a six-year low under $44 a barrel. Poised for a bounce many thought was overdue, short traders raced to cover their positions on fears that the rout, sparked by massive U.S. shale crude supplies, was nearing its end. "The rig count drop was a lot more than people expected and it really got the market going," said Phil Flynn, analyst at Price Futures Group in Chicago. According to Baker Hughes, the decline in oil drilling rigs was the most since it began keeping records in 1987. 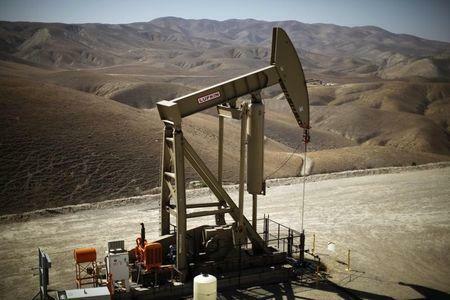 With drillers having idled about 24 percent of their oil drilling rigs since the summer, some traders may be betting that an anticipated slowdown in U.S. oil production is nearer than expected. Some are not convinced that the sell-off in oil is over. The rout began in June when Brent peaked at over $115 a barrel and accelerated in November after OPEC refused to cut its production. "There was a lot of short-covering before the month end from people wanting to take profit from the $40-odd lows, so it's not surprising that we rallied," said Tariq Zahir, managing member at Tyche Capital Advisors in Laurel Hollow in New York. But it will take a while for production to respond to lower drilling. "This doesn't change the fundamental outlook in oil. We are still about 2 million barrels oversupplied." Joseph Posillico, senior vice president of energy futures at Jefferies in New York, also warned of a short-term, short-covering rally that could be quickly reversed. "This is just the market being the market and we could give these all back in the next few sessions."